Do not compromise with your style of furnishing. The Cat Castle will make this possible. A home to your cats and a true diamond when placed in any room. It serves as a comfortable viewing platform as well as a highly resistant climbing and scratching tree. In its interior, continuous openings lead across the entire height. This opens up a lot of possibilities for playing and climbing. The back is completely covered with robust felt, so that the cats can also climb the tower on outside also. In the lower part is a cave without a passage to the top where your cat can hide, sleep and cuddle. Due to the requests of many customers, we did not use sisal, since the fibers would be spread throughout the whole room. The slot-shaped openings on the lowest and top floor invite you and your cat to a lot playing time. A lot of fun is predestined. Cat Castle is an eye-catcher that enhances every modern home decor. It combines lifestyle with longevity and practicality. With every Cat Castle you get a design object of the highest quality, you and your cats will have lot of fun for a long time with. Each individual cat tower is manufactured by specialists in elaborate and careful handwork (production time after order: 2-3 working days). Due to its weight, Cat Castle is very stable and does not require wall guarding. The MDF material from Switzerland is coated scratch-resistant. The edges are natural. You are free to seal these with olive oil. We leave the edges without coating to prevent harmful substances getting into the wood from paint. On request the edges can be sealed with harmless wood oil. 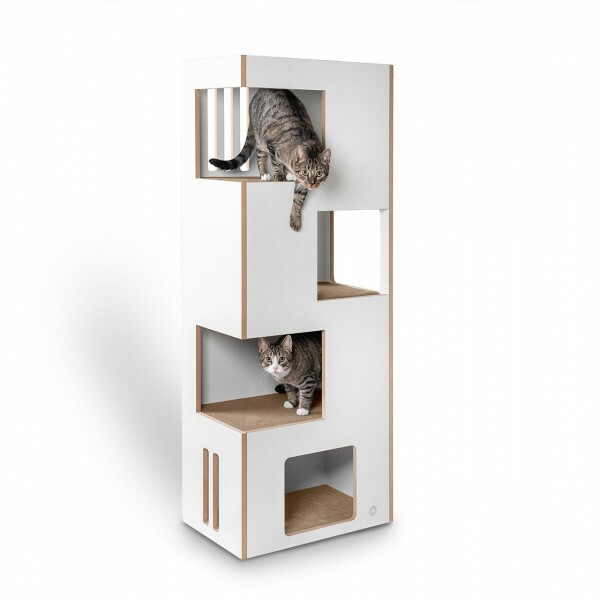 links "Cattree, Cat furniture Cat Castle L – classic beige white"
customer reviews on "Cattree, Cat furniture Cat Castle L – classic beige white"
Lediglich die Spedition sollte imho gewechselt werden. Die Terminabsprache und die Lieferung waren zwar pünktlich und zuverlässig, jedoch ist es eine Unverschämheit EINEN Mitarbeiter mit solch schweren Teilen loszuschicken. Der arme Mann konnte es gerade so allein schaffen das solide schwere Möbelstück zu mir in den 2OG ohne Aufzug zu bekommen. Eine unfassbar verantwortungsloser Umgang mit den Mitarbeitern seitens der Spedition, sollte dies die Regel sein.